In a beautiful address on December 28, 2011, at his Wednesday audience, Pope Benedict XVI spoke of the life of the Holy Family in Nazareth. Here is a short excerpt: "The house of Nazareth is a school of prayer where we learn to listen, to meditate, to penetrate the deepest meaning of the manifestation of the Son of God, drawing our example from Mary, Joseph and Jesus. "The Holy Family is an icon of the domestic Church, which is called to pray together. The family is the first school of prayer where, from their infancy, children learn to perceive God thanks to the teaching and example of their parents. An authentically Christian education cannot neglect the experience of prayer. If we do not learn to pray in the family, it will be difficult to fill this gap later. I would, then, like to invite people to rediscover the beauty of praying together as a family, following the school of the Holy Family of Nazareth. 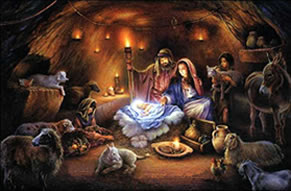 Happy and Blessed Christmas to all! We gather to celebrate the gift of salvation graciously offered to us by our loving God. By this gift, he offers us the possibility of a life giving relationship with him, he enables us to worship him in Spirit and Truth and opens for us the possibility of being united with Him in the Halls of Heaven. 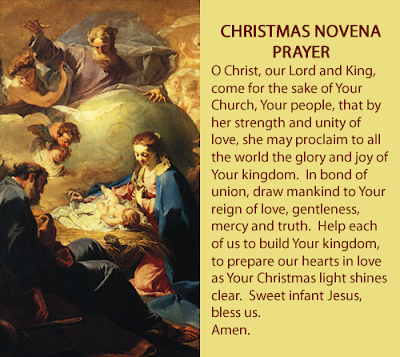 This celebration of Christmas fills us with joy. A joy that is first and foremost spiritual but that manifests itself in concrete ways. We have decorated our homes, set our tables, gathered family and friends. We have prepared gifts for those we love and we have not forgotten the poor and afflicted. May all our efforts to show our joy at the birth of a Saviour lead us to a deeper commitment to follow the Christ Child, the only one who can lead us to peace and joy.